LA Math by James D Stein, published by Princeton University Press. Economics, business or gambling aside, even being friends is easier with a bit of math. This suitor’s dilemma is nicely settled with the help of mathematics in James D Stein’s book, L A Math, brought out recently by the Princeton University Press. The racy 240 page collection of encounters of Fred, a private detective, and his mathematical friend, presents an assortment of puzzles that confound bankers, country club presidents, basketball coaches and just ordinary people, with solutions based on simple math, for the average reader, and some less simple details in the appendix for the more adept. Coming back to the suitor hesitating before the telephone, Stein looks at it as a 2 x 2 game, where both players have a choice of two moves to make, and the route to the best outcome can be worked out with a bit of theory. The method is to first estimate the value of the possible outcomes. (1) Fred calls and Lisa was waiting for him to call, which is great, and the score = 10. (2) Fred calls when Lisa wished he would not, which is no good, the score=0. (3) Lisa was waiting but Fred did not call, disappointing, and the score= 2. Fred’s friend Pete helps Fred work out how often he should choose to call over the times when he should hold off. Let us suppose the fraction of the times Fred calls is ‘p’. Then, the fraction of the times he does not call is (1-p). For instance, if he decides to call one fourth of the time, he does not call three fourths of the time or if he calls once in five times, he does not call the other four times. First, let us take it that Lisa is happy to talk. Fred calls a ‘p’ number of times and the score is p times 10, or 10p. But there are (1 – p) times that Fred does not call, and this score is 2 x (1 – p), which works out to 2 – 2p. The total score is thus 10p + 2 – 2p = 8p + 2. Now let us look at what happens when Lisa is not happy to talk. Fred still calls ‘p’ times and scores zero. But there are (1 – p) times that he does not call, which is a good thing, and the score is 7 x (1 – p) = 7 – 7p. When we take it that it is an even chance what mood Lisa is in, we equate the two outcomes: 8p + 2 = 7 – 7p, which is to say, 15p = 5, or p = 1/3. Hence, to do equally well regardless of Lisa, Fred should call, randomly, once out of every three times there is an occasion to call and not call the other two times, on the average. Now let us plug these numbers back into Lisa being happy or not. If she was waiting to be called, Fred would score 10 one time out of three and the score would be 2 the other two times, which is 14, in all. But if she was not ready, then he scores zero when he calls and he scores 7 the two times that he does not, or 14 again. James D Stein, author of LA Math, published by Princeton University Press. 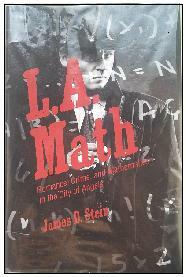 James D Stein, emeritus professor of mathematics at California State University, Long Beach, explains in the preface to the book that entertaining stories set in Los Angeles, with mathematics squeezed painlessly in, was his long cherished dream of a way to teach basic math as fun rather than a chore. The book’s title, LA Math, was hence both one to attract custom, as related to the City of Angels, and also to stand for Liberal Arts, or as a book to teach math to non-science students at university. The book deals with mysteries that bring different clients to Fred and Pete and along with a continuing narrative of the private eye pair and the seamy world of Los Angeles, each episode is solved with a lesson in elementary math, in different areas. The example of Fred and Lisa was one in Game Theory, or methods to find strategies to make the best of the situation despite an opponent’s best moves. The other episodes treat simple math that many often stumble on, like computing averages or the speed of travel, how to add a series of numbers, or the way money increases by interest, and then about the laws of probability. And the appendix contains not only more detailed mathematics of the solutions in the stories, there is also detailed explanation of the way gambling systems work and how betting takes place, on horses or on football matches. In one episode, a client, Julie, has been offered a large prize if she can guess correctly which of three suitors the heroine in a soap opera will marry. After Julie has made her choice, and just before the crucial week in the serial TV show, the client is offered a chance to make a change, but with a cash penalty, and she comes to Fred and Pete for advice. One occurrence in the story line, which is managed by the producers of the show, is that one of the two suitors whom Julie had not backed is eliminated in an accident. So should Julie pay up and make a change, or should she let her original choice stay? Pete’s advice is that she should change. The reasoning is that she started out with a chance of one in three. The probability is that the correct choice was within the two suitors whom she had not selected, but she does not have the option of selecting both of them together. Now, the producers have reduced the field of two to only one, which she can choose, and she should! And then the classic travelling salesman problem, to work out how to connect a number of points in a map so that the no path is retraced or that the total length of the connections is the minimum – a problem that cities face to pick up garbage or for repair teams to visit different places for work. The problem has no exact solution, although there are approximations, which discover the most economical or efficient way in most cases.